IdeaHost is one of the newest members of the hosting community as they just began offering their services to users in 2015. While this can lead to a question about their security, they have certainly passed every test thus far related to reviewers and users challenging their reliability. Their services are hosted from a Tier 1 data center and they have multiple backup facilities to ensure that your data is never lost. It could be said that the jury is still out about just how reliable their services are but at this point there have been very few complaints. As with just about every host out there, IdeaHost gives you the option between using either the cPanel or their website builder. The cPanel provides much more versatility than the website builder although it is generally considered an option designated for users that are experienced with its use. The website builder has a drag and drop menu that allows you to create a website catered to your unique needs. When choosing this option, however, you will not be able to switch back to the more versatile cPanel. It should also be noted that you can choose from over 1000 fully customizable website templates. They also give you quite a bit of freedom as far as creating a blog or even running your own forum. 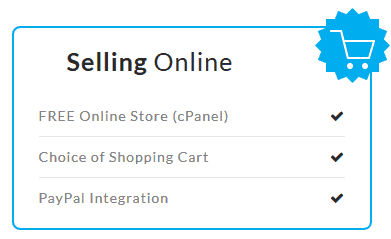 The e-commerce features that IdeaHost offers are really their bread and butter. While you will have to purchase your own shopping cart and billing software, creating an online store really cannot get much easier than doing it through their website builder. In order to start a store you will also need an SSL certificate, which can be purchased directly from their site. They make it easy to install everything you need to get started and provide recommendations for software that will allow you to get you store up and running within a few days. Another reason that IdeaHost is a great option for opening a store or running a business is that they have plenty of marketing tools to help you promote your site. They provide detailed site analytics that allow you to quickly see what you can do to improve your site and have some solid SEO tools to use as well. 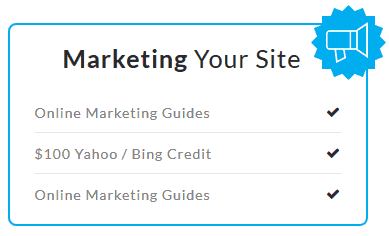 As with most hosts, they also offer a hundred dollars in both Adwords and Bing Credits to help you get started with promoting your site. One of the advantages of being the new kid on the block is that you have the ability to figure out what your competitors are not offering and then provide that your customers. IdeaHost has done this by providing customer support that features step-by-step tutorials for completing everything from building your site to creating and running a blog. They also offer 24/7 support through email, live chat, and by phone. One of the perks that a lot of users have mentioned that they appreciate is the fact that their customer service team is predominantly English speaking Americans. Overall, you would be hard pressed to find a host that offers better customer support than what IdeaHost does. They clearly go above and beyond in this area. The number one con associated with trusting IdeaHost as your website host is that they are incredibly new to the industry. There is very little information available about the who, where, when of their creation so there could certainly be a bit more transparency on their part. As I mentioned multiple times throughout this IdeaHost review, however, there are very few if any complaints to date about the quality or reliability of their services. 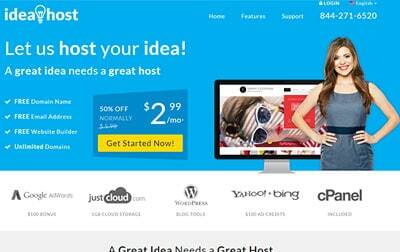 IdeaHost offers three different plans for potential users to choose from. Their express option, for users that choose cPanel, is offered at a monthly price of $6.99/month. Committing to a year with this plan will mean you pay $4.99/month while committing for two years is $2.99/month. The other two options that they offer include the Create and Business plans. 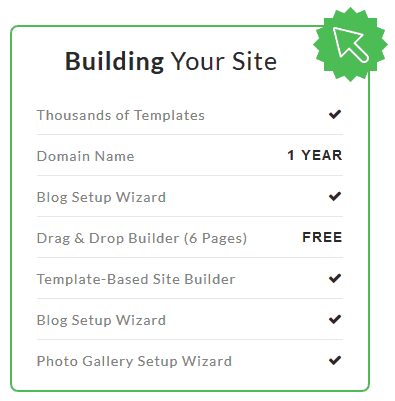 The Create plan is for users that will be using the website builder and comes in at $7.49/month. The one year plan for this is $5.99/month while the two year plan is $3.99/month. The Business plan is $8.99/month if you pay monthly, $6.99/month with a one year commitment, and $4.99/month with a two year commitment. This plan is obviously for users that plan on utilizing the e-commerce features that IdeaHost provides. While these prices are fairly similar to what other hosts offer, the value of the e-commerce features makes it a strong option for users that plan on starting their own online store. While the fact that IdeaHost is extremely new can lead to some anxiety with users, there have been very few complaints thus far about the quality of the services that they offer. The fact that their customer support is among the best in the industry also takes away a lot of the potential stress that users may have. Overall, they are among the best hosts for individuals looking to start an e-commerce store that looks both professional and visually appealing. The amount of features and options that they have related to opening and growing an online store make them a tremendous choice in this space. And, with their 45-day money back guarantee, there really is no risk in giving their services a shot. We found a lot to like with IdeaHost. Their custom cPanel is much cleaner than the default cPanel skin, yet still includes all features. Arvixe In-Depth Review: Web Hosting Secrets Unveiled! 1/5 would be very generous. Signed up over a week and a half ago and they still have not managed to create my email account, one of the most basic functions of the site. I finally gave up and cancelled the account. I would like to confirm that Ideahost don’t deserve the evaluation they are showing they have been given. It is not true. The evaluation given 4/5 is worked out. The real evaluation must be 1/5. This hosting agency caused me too many issues. First, they are telling that when you build your website via the Cpanel you receive unlimited mailbox hosting, This is not true. I was charged 20 GPB per month. The sitebuilder is offering very limited options, the website is loading very slow and the customer service can do nothing for you. When you open the chat discussion to tell about the issue, they allocate you a case issue and tell you wait that it will be resolved. Well… you can wait 7, 9 weeks and nothing is done. If you want to join a site that will nickle and dime you for every transaction then this site is for you. Half of the stuff is broken in cpanel, running scripts is a headache, their support is horrible. They are cheap, super cheap for the first two years (in fact you can get 70% off the first two years just by refreshing the checkout page a few times and clicking on the offer they use to keep you on the site.) but there are free sites that are better out there, they just don’t offer unlimited email addresses. I would suggest justhost as a paid alternative to this, or 000webhost as a free one. I have been with this rubbish host for over 6 months now and so far there have been 2x occasions where I have been unable to log into my email account! It’s ridiculous and the support team are unhelpful and ask for your password and log in details???? They should be able to fix the problem should any arise without asking for customers passwords. Pay a bit more for something that works and where the hosts/ support team can actually help! I have been with Ideahost for a couple of days so far. Good experience overall. I do not have any complaint. We help people travel. I hope to stay long enough as I like their novelty in the hosting business.